Last March we did a lot of driving through the Netherlands, Belgium and Northern France. 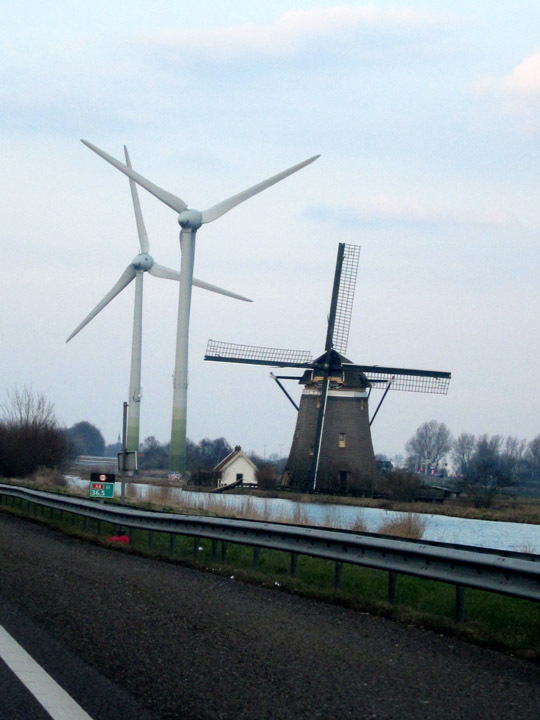 Looking forward to the stereotypical windmills and tulip fields, I kept an eye on the landscape. Things were decidedly more modern than I expected. I caught this grouping from the car as drove back to Amsterdam. I love the juxtaposition of modern and traditional! In addition to the lovely, rolling agricultural hills, this region had quite a number of wind turbines catching the Atlantis gusts. With good roads and nice scenery, it was quite a pleasant drive – definitely worth keeping an eye out for surprises.